The Instituto Libre de Segunda Enseñanza is a high school that depends on the Universidad de Buenos Aires (UBA). 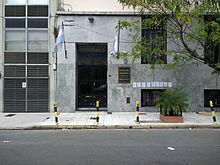 It has approximately 1000 students, and it is located in Libertad 555 street, Capital Federal, Buenos Aires, Argentina. As it is affiliated with the University, it has an admission process that lasts one year and consists of an admission course, which involves multiple exams in Mathematics, History, Language and Geography. Almost all of its faculty teaches in the UBA, and physical education is performed at the Universidad de Buenos Aires campus, in Ciudad Universitaria. One of its characteristics is that there is no need to do the CBC (a public admission year to enter the university), because it offers its students the possibility of attending an extra 6th year in the career they have chosen. The school has a reputation for being strict and rigorous, not admitting students who have been held back, or have more than one subject that hasn't been passed.) The school has also earned several education awards for its academic excellence. 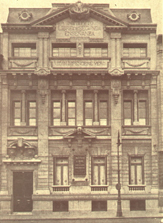 The Instituto Libre de Segunda Enseñanza in 1892. The Instituto libre de Segunda Enseñanza was founded in 1892 by a group of men with experience in education who, before, during and after their activities in the school, occupied important scientific, political and social positions. Almost all of the men who composed the teaching staff of the institute came from the historical Colegio Nacional de Buenos Aires school, to which they resigned collectively as a reaction to the dismissal of the director by part of the government. In a visit carried out by the Chief Inspector of the Ministry of Education to the Nacional de Buenos Aires school, a small group of students displayed attitudes that he considered irreverent. Angered, he compiled a report that requested, among other things, the release of the young Director, Adolfo Orma. Twenty-four hours later, the Executive authority decreed the dismissal of Dr. Orma, and temporarily naming the Inspector. The school's facilities are: five labs (Chemistry, Biology, Physics, Computer Science, and Arts), a library on the last floor that serves as a study area, and a variety of art and science workshops. Languages: French, English and Latin (last two until 4th year). Sports: Volleyball and Hockey (female) Volleyball and Basketball (male). Academic Departments: Arts, Natural Sciences, History and Constitutional Law, Geography and Economy, Physics education, French, Humanities, Computation, Language and Latin and Maths. ^ "Decisiones rígidas en los colegios". 18 March 2007.